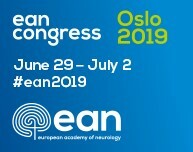 A new study suggests a dual mechanism of actions of overactive and cytosolic re-localized BRCA1, the major guardian of genomic stability, in neurons death by aberrant DNA damage response and presenilin 1 dysfunction in Alzheimer's disease. A new University of Florida study finds that 23 percent of adults age 60 and older who underwent a total knee replacement experienced a decline in activity in at least one region of the brain responsible for specific cognitive functions. Fifteen percent of patients declined across all brain networks the team evaluated. 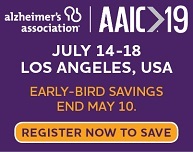 An association between inflammation biomarkers in both blood plasma and cerebrospinal fluid and markers of Alzheimer's disease (AD) associated pathology, has been found by researchers at the University of Colorado Anschutz Medical Campus working with the University of Wisconsin Alzheimer's Disease Research Center and the University of California San Francisco Memory and Aging Center. The discovery sheds new light on the pathology of AD as well as on the communication between the brain and the rest of the body. While most treatments for Alzheimer's disease focus on improving memory, researchers at The Ohio State University Wexner Medical Center conducted a study aimed at slowing the decline of problem solving and decision-making skills in these patients. Thin electrical wires were surgically implanted into the frontal lobes of the brains of patients with Alzheimer's disease to determine if using a brain pacemaker could improve cognitive, behavioral, and functional abilities in patients with this form of dementia. Trace elements of lithium in drinking water can slow death rates from Alzheimer’s disease, Brock University research has found. Rates of diabetes and obesity, which are important risk factors for Alzheimer’s disease, also decrease if there is a particular amount of lithium in the water, says the study, published recently in the Journal of Alzheimer’s Disease. TauRx Therapeutics Ltd today reported the full results from its second Phase 3 clinical study of LMTX®, the first tau aggregation inhibitor in Alzheimer’s disease, published online in the Journal of Alzheimer’s Disease. 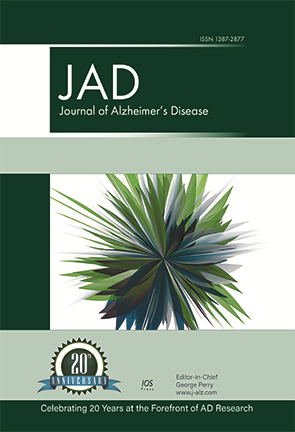 Researchers from the Harvard affiliated Hebrew SeniorLife Institute for Aging Research (IFAR), in collaboration with scientists from Beth Israel Deaconess Medical Center (BIDMC), Harvard Medical School (HMS), and Brown University, have found increasing evidence that the level of delirium in post-surgical patients is associated with the level of later cognitive decline in those same patients. 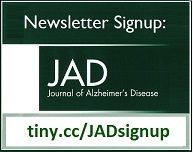 Findings from this study were published today in the Journal of Alzheimer’s Disease. A new study in the Journal of Alzheimer's Disease by researchers at the Paul Sabatier University in Toulouse identifies a 5-item version of the McNair and Kahn Scale for predicting cognitive decline. A new study from the Multimodal Neuroimaging for AD Diagnosis (MULNIAD) study, which is a prospective study implemented at the National Center for Geriatrics and Gerontology (NCGG), provides that hypometabolism in the medial prefrontal areas is specifically associated with Alzheimer’s disease-related nutritional problems, and decrease in fat mass may have a key role. 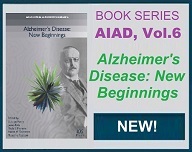 This study is published in the Journal of Alzheimer’s Disease.